An Astrological Look at the Movie. Have You Ever Had a Dream You Were So Sure Was Real? Richard Giles examines and dissects the smash film "The Matrix", in the light of its many subtle references and the astrological indications connected with its release. This post-modern version of Descartes' "Evil Demon" theory has taken the cinematic world by storm. The three-part article also looks at the astrology of the people who have made this contemporary classic. Cinema is visual magic and using astrological tools to examine why movies have such an effect on us we need go no further than Neptune, the ruling planet of cinema. Neptune, the mother of fantasy, make believe, illusions and the fountain of inspirational energy is the planet of images giving us cinema. The power of the moving visual image to influence us is never more clear than in its capacity through the movies. We know that a film is just a series of extremely fast single frames projected onto a screen with actors playing their roles, but its impact has such a profound effect on us, whether for entertainment, propaganda, fun, information or inspiration. The Matrix delivered a new understanding of the role of cinema, taking us to a deeper comprehension of why we are here and what we are doing - "What's it all about Alfie", in the words of the English film hit of the sixties. 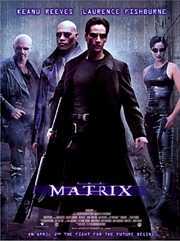 When released in 1999, The Matrix took the cine public by storm, introducing visual effects and techniques that broke new ground in the same way Star Wars opened up cinema goers to a whole new world of visual effects, or in the way that Shreck broke ground in its stunning cartoon realism effects. Its has been called, variously: brainy science-fiction, superaction-adventure, martial arts, zen cyberpunk, new wave kung fu, post-modernist philosophy and many other descriptions that fit the extraordinary nature of the impact it made on the public. It arrived pretty well unannounced at the box office quickly developing a following of fans that has since amazed Hollywood and movie critics. All acknowledge the remarkable new framework established by the film in special effects, especially the slow-frame martial arts sequences that bedazzle throughout the first movie. What is the most interesting part of The Matrix phenomenon is that for many, it's become an anthem for awakening to the true nature of a twenty-first century consumer-driven society that we're all part of. In fact, it puts forward an astonishing truth that many find hard to come to terms with - that this 'real' world may be a computer driven virtual world and the real world is actually a bunch of weird high-rise towers with millions of comatose humans bathed in a warm solution feeding energy into a gigantic machine that is run by other machines and in turn powers an Artificial Intelligence running the planet. Nobody is actually living the life they think they are in -- its all a dream. The Matrix is a virtual world run by machines who are in total control. The Matrix has got us all by the short and curlies. In the beginning the realisation is scary, in fact its frightening. In the process of writing this I asked people how many times they had seen The Matrix, as multiple viewing seems to be par for the course with this movie. First I ran across those who had seen it twice, then 6 times, then another 12, then 25 times, then one at 65 times, but the record was a twenty year old who had said he had seen it about 120 times! I felt truly inadequate then, having only seen it 8 times. Onto the scene comes a group of guided rebels who are not part of the Matrix. Also onto the scene comes Mr Thomas Anderson (played by Keanu Reeves) who works for a large successful computer business that demands loyalty and punctuality, as Mr Anderson finds early in the movie. Anderson is a troubled man living in what looks like a god-awful hovel of an apartment and who stays up nights fiddling with his programs and computers, trying to find the answer to why and who he is. He knows something is wrong, but he doesn't know what it is. One night falling asleep over his keyboard, a message on the screen awakens him. The message says simply - "Wake Up Neo.... The Matrix Has You......"
On typing in a question, he is directed by the message to ..."Follow the White Rabbit". At this point, readers of Lewis Carroll will get the allusion immediately. The White Rabbit in Alice in Wonderland served as the direction Alice was given in her quest through the looking glass world where everything is the reverse of what we see in this world. The Wachowski brothers, makers of the film, have set the parameters for a rocky journey into the nature of reality, as Lewis Carroll did a century before. Mr Anderson slips between seeming dream and reality to find himself finally meeting the mysterious Morpheus (Lawrence Fishburne), who makes him an offer. This is also after he meets the legendary Trinity (Carrie-Ann Moss), another famous computer hacker, in a rock club, after seeing a White Rabbit tattoo on the shoulder of friends who knock on his door for a contraband computer program. The next day he is caught by Agent Smith, one of the police-like agents of the Matrix and is taken to be interrogated. Agent Smith does some weird things to Anderson's mouth; that tells him something is really wrong. Agent Smith is played by Hugo Weaving. Weaving was born 4th April 1960 (Lagos, Nigeria - time unknown) with his Sun in Aries in a T-square to Moon in Cancer opposite Saturn in Capricorn - good for playing a Saturn ruled, emotionless agent of the Matrix. See how the slow speech and empty expressions dominate the agents' behaviour (although later Agent Smith starts to shows some emotional connection with his antagonist Matrix revolutionaries). Weaving has four planets in Pisces opposing the mid-sixties Uranus/Pluto conjunction (see later), especially Mars and Chiron opposite Pluto. This connects him into the violent martial fight scenes that are such an integral part of the movie. Anderson wakes the next day as if from a dream, thinking everything is back to normal. But the revolutionaries intervene. He is taken to meet Morpheus. At their meeting, Morpheus offers him two choices, two pills. "I'll show you how deep the Rabbit Hole goes", says Morpheus. Anderson (now known as Neo, his hacker name), can take either the Red Pill or the Blue Pill. The Red Pill will show him truth, or the Blue Pill will let him wake up the next morning with everything still normal in his world as he would want it to be. Neo decides and takes the Red one and we see his comfortable world of late twentieth century living literally fall to pieces, as does his body. Part 2 of this article explores more of the astrological make-up of The Matrix, the movie and its cast and crew.